In 1982 Queen toured in support of their new album “Hot Space”. 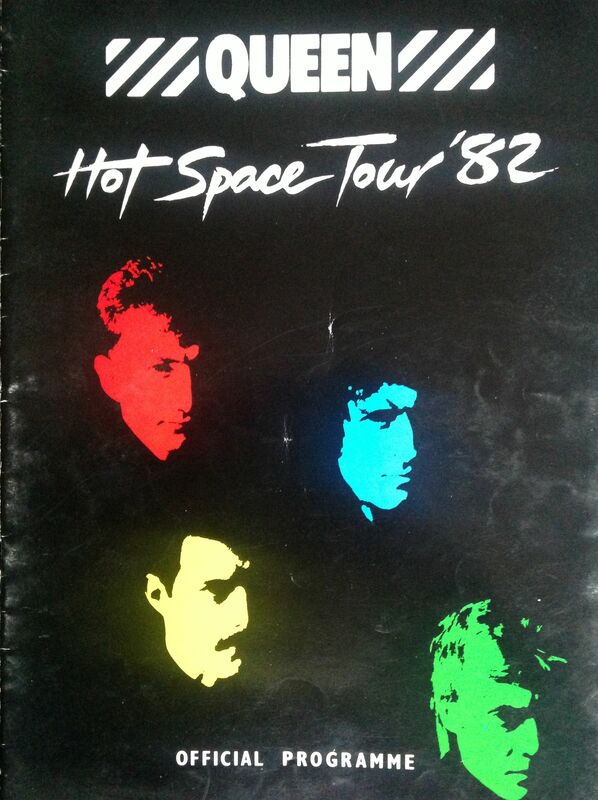 “Hot Space” was Queen’s 10th album and saw them experimenting, not that successfully in my view, with disco. The UK leg of the tour consisted of two massive outdoor shows at Milton Keynes Bowl, and Leeds Elland Road football stadium, and two large indoor concerts at the Royal Highland Showground, Ingliston, Edinburgh. I drove down to the Leeds gig with a group of mates. It was a very hot Saturday, on a bank holiday weekend. I think The Teardrop Explodes opened the show. Now, I was a fan of this band and of Julian Cope in particular. He was a crazy and intriguing front man and they had some pretty neat pop / new wave tunes; notably “Treason” and “Reward”. However, they were viewed as a “punk” band (and hence not “proper” rock) by a small section of the audience who decided to pelt them with bottles. Not a good start to the day. We were all quite excited about seeing American rock band Heart who featured the amazing (and beautiful) Wilson sisters; Anne and Nancy. We had all been fans since one of us bought “Dreamboat Annie” in 1976; we all borrowed and played that album again and again. Heart’s set included great versions of some of our favourite tracks from their mid-’70s heyday: Magic Man”, “Crazy On You” and the excellent, rocking “Barracuda”. True to their classic rock roots, their encore was a cover of Led Zeppelin’s “Rock and Roll”. The final guest act was ex-Runaway Joan Jett with her band the Blackhearts, who got the crowd singing along with “I Love Rock ‘n’ Roll” , which had been high in the charts a few weeks earlier. There was a long wait for Queen. I suspect that they were waiting until it was dark so that the light show would have its greatest effect. Finally, after what seemed forever, the intro to “Flash” boomed across the stadium, followed by ridiculously loud explosions and blinding white flashing lights. Queen exploded onto the stage, Freddie starting to sing “The Hero”. The sort of spectacular entrance that Queen had perfected. The rest of the show was similarly spectacular with Freddie leading the band in those anthemic classic songs, and goading the crowd to sing along. 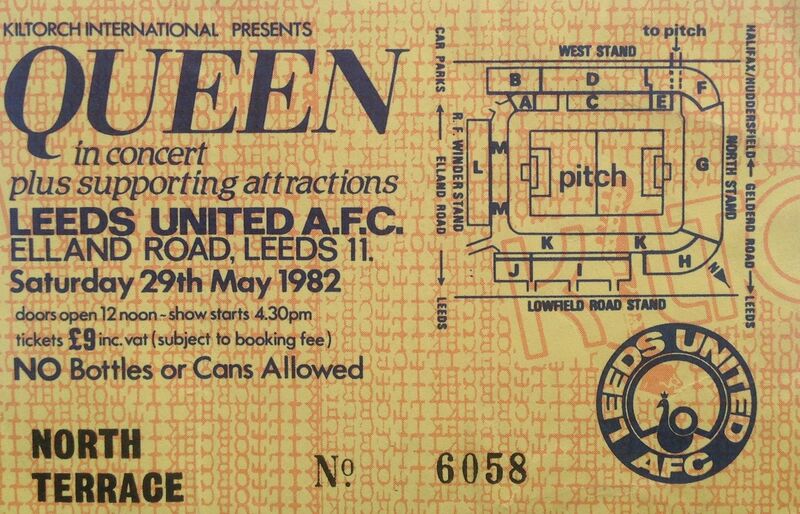 I remember wondering how they would recreate the David Bowie vocal on “Under Pressure” and secretly hoped that he might run out from stage left 🙂 (I wasn’t the only one; rumours were circulating that Bowie would appear with Queen to sing his parts onstage in Leeds and/or Milton Keynes; but of course he didn’t). Instead Freddie Mercury and Roger Taylor shared the vocal parts. Another great performance by Queen. Musicians: Freddie Mercury – lead vocals, piano, tambourine, acoustic rhythm guitar; Brian May – electric & acoustic guitars, backing vocals, piano; John Deacon – bass guitar, rhythm guitar; Roger Taylor – drums, electronic drums, backing vocals; Morgan Fisher – piano, synthesizer, backing vocals. Strange one this. I googled this festival and can find very little on it. I have the small programme which I have included here, and looking at the line-up this event must have taken place in the mid 80s. The festival was at Exhibition Park just outside of the town. There were folk, rock and jazz stages. Roy Harper appeared in a marquee on the Friday night, as part of the Folk stage. Support came from Michael Chapman and Isaac Gullory. A group of us went through to see Roy. He was back to playing solo with an acoustic guitar, and sang a set of favourites. The rest of the bill included Beloius Some and Gonzalez. I also recall seeing Joan Jett and the Blackhearts at an event on Exhibition Park. I can’t recall whether this was the same event, however, Joan Jett is not mentioned in the programme, so I guess it was a different event. Actually my (very bad) memory seems to be telling me that the Joan Jett concert was a Radio 1 event held at Newcatle? I also saw Roy Harper at Newcastle Riverside around the same time, and remember him playing a very long (and excellent) version of Me and My Woman. Roy went through a difficult time in the 80s, both financially and musically. Roy, speaking to the Telegraph in 2011: “I ended up owing EMI £82,000 in 1980. I lost my house because I was in so much debt. So in 1982, I started again from scratch. But I wouldn’t want you to write this up in a negative way, because it’s been another lifetime since then, and it’s been a great life, actually.” Postscript. 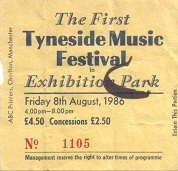 I found my ticket for this event which shows it took place on Friday 8th August 1986. Mystery solved.